There is so much dietary advice out there, much of it conflicting, that it can be difficult for busy parents to make sense of it all. Medical doctor and sports scientist, Professor Tim Noakes, chef and long-distance swimmer, Jonno Proudfoot, and dietitian Bridget Surtees, a specialist in paediatric nutrition, cut through the clamour to provide clear, proven guidelines and simple, delicious recipes to feed your family well, inexpensively and without fuss. Following their phenomenal, record-breaking success with The Real Meal Revolution, the Real Meal team set out to rethink the way we feed our children. The result, Superfood for Superchildren, challenges many ingrained dietary beliefs and advocates a real-food diet for children - from toddlers to teens - that is low in sugar and refined carbohydrates. Their advice is solidly underpinned by a critical, scientific interrogation of the the children's food industry. 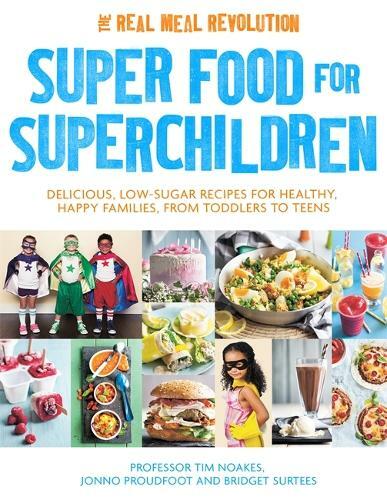 By combining the latest peer-reviewed scientific evidence with straightforward, mouthwatering recipes, most of them for the whole family, Superfood for Superchildren shows clearly how to provide your children with the best possible nutrition to help them to grow up healthy and happy.